Thanks to the many who left comments on my last post on the depressing published number of persons voting for Suzuki Nobuyuki, a candidate for a Tokyo Metropolitan District seat in the 21 July 2013 House of Councillors election. Your attempts to put me at ease or encourage me to have a little perspective kept me looking at the impossible-to-believe purported 74,465 Tokyo voters who were so driven by intense xenophobia as to write down on their ballot papers the name of a candidate whose main proposal is the closure of Japan's borders to citizens of South Korea. In my heart, I knew, just knew that that number had to be wrong -- that 1.4% of Tokyo residents could not be so marginalized and filled with blind, ethnic hatred as to vote for such a man. As it turns out, I was right: the number is wrong. Provably so. The question is only to what extent. Alert readers probably noted my awkward insertion in the first paragraph of two past participles: "published" and "purported." It is right to ask what is up with that. A look at the actual results of the votes counted on election night shows that Suzuki Nobuyuki was not credited with having received 74,465 votes, as the news agencies reported. The Tokyo Metropolitan Election Committee credited Suzuki Nobuyuki with having won 74,465.376 votes. According to the TMD's electoral authorities, Suzuki Nobuyuki received a non-whole number number of votes. By any chance did anyone else receive a non-whole number number of votes in Tokyo in this last election? Yes. One candidate is credited with having received 552,714.570 votes. The candidate for the Democratic Party of Japan: Suzuki Kan. When two candidates share a name, whether it is a surname or a given name, ballots marked with that one name alone are set aside, rather than being destroyed as invalid (for those wondering, in this month's House of Councillors election 3.15% of district ballots nationwide were deemed invalid, 2.24% of district ballots in the TMD). These set-aside ballots are then counted up, with the total then divided and a proportion of the votes given in equal measure to the candidates sharing the name. This is true even when the number of these ballots not divisible by the number of eventual recipients, meaning that a last vote has to be divided into fractions of a vote. So we know, based upon the official count, that persons wishing to vote for either of the two Suzukis on election day failed to fill out their ballots in a manner that clearly indicated which Suzuki -- the DPJ candidate or the xenophobe -- they were choosing. As a result they had their votes split up by the election committees. Just how many folks wrote just "Suzuki" - in hiragana, in katakana, in kanji or some combination thereof -- and had their votes set aside and divided up equally between both Suzukis? One would have to ask each and every one of Tokyo’s election committees for their particular total of set aside vote totals. That is a lot of phone calls (Professor Steven Reed of Chuo Daigaku, a project for one of your students). The gist: for an unknown number of DPJ voters, writing down the surname and just the surname of their candidate would lead to their votes being divided in between their man and a far-right nightmare candidate. Suzuki Kan's campaign tried to avoid this outcome by asking, not with a great deal of fervor, mind you, that voters write down his full name in hiragana -- i.e., すずきかん . To his credit -- and credit is in very short supply here -- Suzuki Nobuyuki's campaign posters had his name in kanji - i.e. 鈴木信行. So some attempt at differentiation was made, even though, if only the surname was on the voter's ballot, the ballot would get tossed into the bin of set aside ballots no matter what the writing system used. 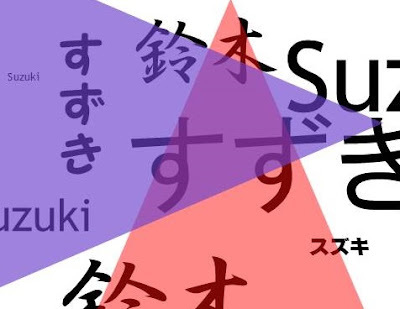 One problem is, of course, that writing a person's full name in hiragana feels wrong, especially when the surname is one as common as "Suzuki." Another is that Kan is a really, really, odd given name -- the mind rebels when even thinking about it, much less writing it. Confusion of identical surnames was further heightened by proximity. By the most perverse of coincidences, the two Suzukis drew successive slots, #14 and #15, on the Tokyo district candidate list. This meant that on the campaign poster boards and in the voting areas, the two candidates out of the 20 on the ballot with two most similar names were right next to each other. b) ballots where the voter managed to put a full name down, only it was not the Suzuki he or she wanted but the full name that seemed right. In the latter case, assuming that voters made personal name switching errors at a constant rate (i.e., setting aside the reality that Nobuyuki sounds pleasanter to the ear than Kan), for every vote Suzuki Nobuyuki lost to a mistaken vote for Suzuki Kan, he received over 7 votes in return (552,714 / 74,465 = 7.422). How many hundreds or, in my estimation, tens of thousands of votes switched sides is not knowable. Just random error or not realizing there was another Suzuki on the ballot would lead to a significant flow of votes from Suzuki Kan to Suzuki Nobuyuki. Detractors could point out that 2013 was not the only time the two Suzukis faced off against each other. Indeed, the two were on the ballot in the 2007 House of Councillors election. In that year, Suzuki Kan was credited with having received 780,662.470 votes, while Suzuki Nobuyuki was credited with 21,548.472 votes. The difference, a detractor could say, is that in 2007, Suzuki Nobuyuki was up against Tojo Yuko, the granddaughter of Tojo Hideki, for the maudlin, Japan-is-a-victim vote. With Tojo gone to meet her beloved grandfather, Suzuki was the one choice nut on the ballot. The two elections are not entirely commensurate, though. Suzuki Kan in 2007 was the beneficiary of awareness and coverage of DPJ candidates, making it harder for voters to vote for Suzuki Nobuyuki in error. The candidates were also not adjacent to one another, though at #13 and #15 on the 2007 list, they were still in general proximity of one another. Whether one believes the resulting flows of votes great or insignificant, the presence of two Suzukis certainly means ballots were cast for the wrong Suzuki. Funny thing about Suzuki Nobuyuki. Even though he was present at the creation of the Isshin Shimpu Party in 1995, was named leader of its Tokyo branch in 2005 and has been supreme leader since 2010, he seems to have run for public office only twice: in the 2007 and 2013 House of Councillors elections. He did not run for a seat in 2010. Indeed, Isshin Shinpu did not have a candidate in the 2010 election. Any guesses as to which party, or the supporters of which party, would pay encourage the Isshin Shinpu party to run a candidate capable of stealing votes away from the DPJ's candidate? Could it be the same folks who kicked in some cash encouraged the Isshin Shimpu to run a Matsumura in 2004, when the Communist candidate's name was Imamura? The one bright, shining aspect of this narrative: unlike the alternative, a Tokyo where legions of subterranean xenophobes now lurk, the Tokyo of dirty electoral tricks -- the hiring of candidates to run in order to confuse voters regarding the identity of rivals -- is the Tokyo I know. It is the same Tokyo that in the 2010 House of Councillors election had two district candidates with the same surname, with fractional results in the end for both, where one of the candidates was an unknown independent and the other was...wait for it...a DPJ House of Councillors member seeking reelection. I can live in city of silly confusion and trickery. A city of prejudice and jut-jawed ignorance (Suzuki Nobuyuki is a high school dropout) -- that I find hard to bear. A good observation. Considering Suzuki Kan lost out to the LDP's 2nd candidate, Takemi Keizou, on the 5th seat, by a mere 59,674 votes seems to give credence to your theory. Then again, Suzuki Nobuyuki taking votes away from Suzuki Kan might not have become significant had the DPJ not shot itself in the foot by opting to endorse only Suzuki Kan while abandoning the clearly anti-nuclear Okawara Masako, compelling former PM Kan Naoto, responsible for the landmark renewable energy bills, to back her as an independent and take votes away from Suzuki Kan.
Good spotting I would say. Was his platform only based on blocking south koreans? or were there other items in there that people could have voted for? ie free electricity for retired people etc. That were simply so attractive that people were willing to ignore the whole racist bit. (eg "I don't know any koreans so not anything I care about, but I do want free ") So simply trading on peoples ignorance and desire for free/better stuff. Well there is a bit of a silver lining to this story after all. I'm relived there aren't as many xenophobe Tokyoites as originally reported. There must be a better way to differentiate candidates that have similar names. Insights of this type are rare, thanks! I wonder why the incomplete ballots are not simply discarded. I think the answer has something to do with the large number of candidates vying for a large number of slots. It is possible that there will be outcomes where as few as 10 votes will separate the winner of a last seat from a loser. If the loser shares a name with another candidate on the ballot, and had by this lost votes, the indistinguishable ballots having been thrown away, there would likely be grounds for a lawsuit against the election committees challenging the results. Giving fractional votes for partially completed ballots makes it harder for the losing candidate to claim he or she was not treated equitably. It would be fun to look at the laws that have either mandated or encouraged the development of this system of giving partial credit.